There's a radar-confirmed tornado near Berlin, GA.
Will be interesting to see what happens in GA north of I-20 with the convergence line along the GA/AL border right now. Showers beginning to fire on it and can't rule out damaging winds, hail and even a few tornadoes as this line gradually strengthens and moves eastward. Starting to fire now. 60% chance of Tornado Watch per SPC. Curious how far south and east it will go, if issued. Storms are firing south of the Meso discussion issued at 3. Good job SPC, NWS and TV mets for spending a week forecasting this event and spending all day and night keeping us safe! For an outbreak, the low number of fatalities (as always, 1 is too many let alone 3?) and a low amount of injuries, is a blessing and awesome. Looks like word got out, people heeded and lives were saved. Yet people are still mourning today, hurting mentally and physically, some have lost everything materially and there are states still dealing with these storms. I’m only going to mention this in passing but there’s another event coming up later this week. Oh man. That thing means business. Major hook now. 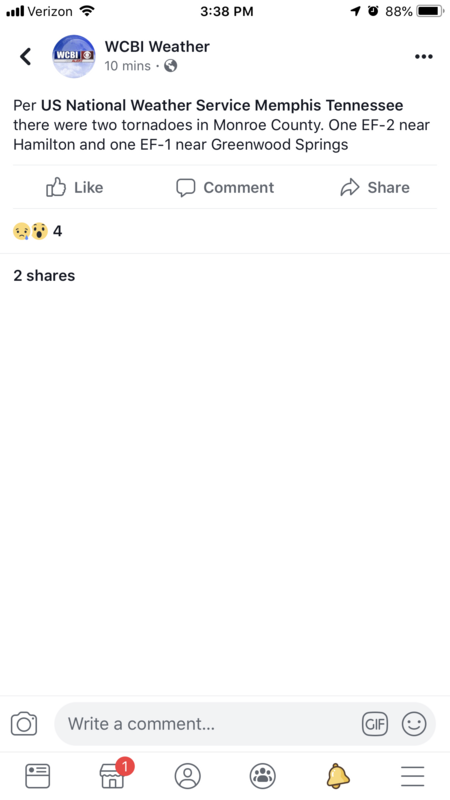 Willacoochee area is under the gun. Wow that is one of the most impressive we have seen with this storm system. 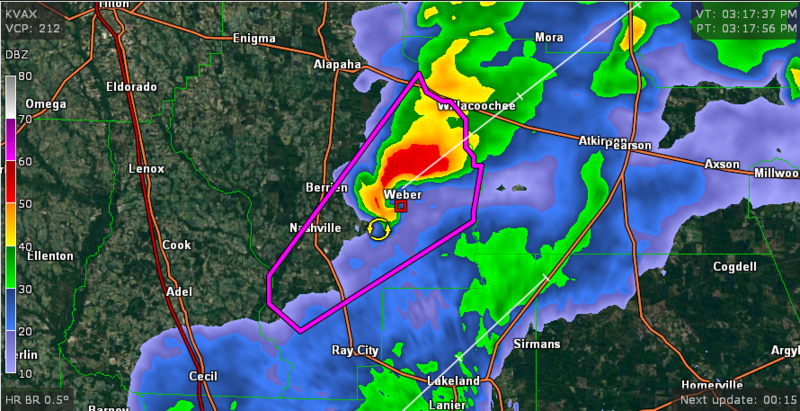 Trying to find info on Weber, GA.
Hamilton tornado EF2, not sure if preliminary. NWS HUN reported back they found damage in Colbert Co, AL but haven't made the rating yet. Does anyone here know what television market(s) that area falls under? There's a fairly substantial BWER on a cell west of Mansfield, OH. Lower than I would have thought. 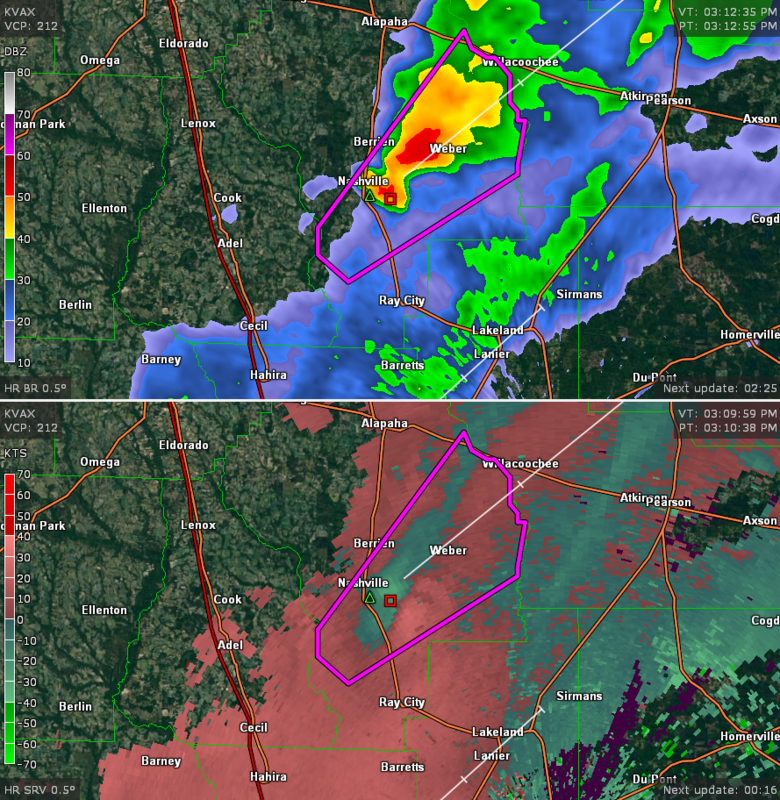 Maybe a TDS trying to show up near Douglas Ga? The area of low CC is located in an area of low reflectivity. 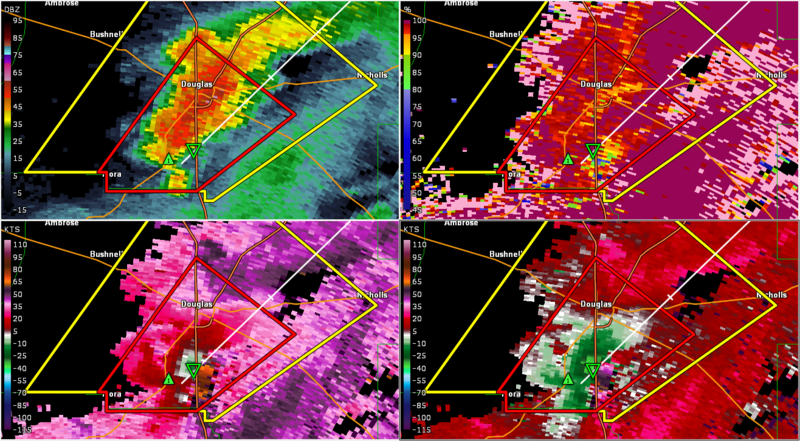 It's probably just picking up some relatively small objects in the inflow (e.g. leaves, bugs, that kind of stuff). Weather spotters have a confirmed tornado on a cell north of Mansfield, OH. If it continues on its current trajectory, it could impact Cleveland. Let's hope it weakens before then! 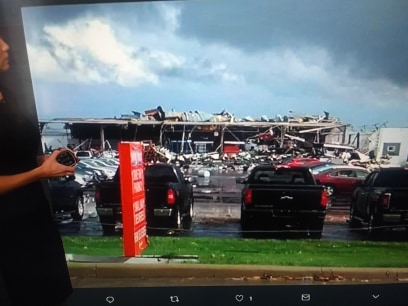 Seeing images of significant damage to businesses in the town of Shelby, Ohio.